As some of you may know, I have my very own product line! By that I mean I have formulas to each of my products which I take ingredients and make all of the products from scratch. I do not use any "bases" and simply add a few more items to it. No, I buy all of the ingredients, cook each item on my stove, mix it together, and everything else. I purchase bottles for the items to be shipped in and created my own labels to go on each product. I then box it up myself and ship it to you! Before, you could go to the website where I list all of my hair services and also buy products but now it has it's own website (www.silkhydrationbyljones.com). Here is a list and description of all of the products that are now in the line. 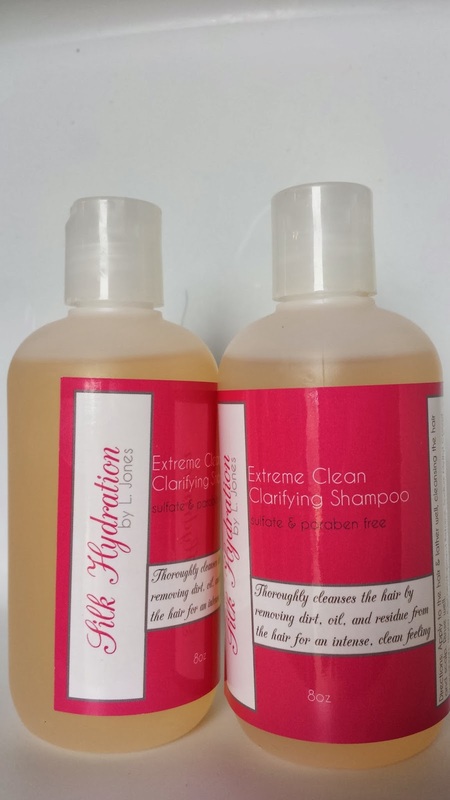 Silk Hydration by L. Jones Extreme Clean Clarifying Shampoo- The clarifying shampoo is one that removes all dirt, oil, residue, and product build up from the hair. This is great to shampoo the hair with the first time so that you can start with a clean slate. It gives the hair that "squeaky clean"feeling. This is great for oily hair because it removes everything from the hair that weighs it down. It is also good for dry hair because it removes any product build up that may be on it like oil, grease, etc. Silk Hydration by L. Jones Extreme Moisture Shampoo- The moisture shampoo is great because it adds the good moisture back in the hair that was shampooed out by the clarifying shampoo. It has liquid silk in it which softens up the hair and makes it very silky to the touch. Silk Hydration by L. Jones Intense Moisturizing Treatment- This treatment is excellent for dry or damaged hair. It is also great for maintaining healthy hair. Check out everything I put in it and why here. After you rinse this from your hair, it will be extra soft and silky! Silk Hydration by L. Jones Daily Conditioner- The daily conditioner is a lightweight conditioner that moisturizes the hair in only a few minutes. Simply comb through hair, let sit for about five minutes, then rinse. You will immediately feel a difference in your hair. Silk Hydration by L. Jones Leave-In Conditioner- The leave-in conditioner is one of my favorite items in the line! I use it every single time I shampoo my hair. It helps to detangle the hair and adds an extra layer of moisture to the hair. Also helps protect the hair from heat styling tools. Silk Hydration by L. Jones Miracle Potion no.9- This is an anti-frizz and shine enhancing spray. It is great for natural hair because it keeps the hair from frizzing. It is great for relaxed and natural hair because it also adds shine. It is very lightweight and the hair still moves and has body once the product is applied. Remember, to order any products go to www.silkhydrationbyljones.com. And in honor of my 33rd birthday which was this past weekend, I'm giving everyone 33% off for 3 days! Just use the promo code: TOYABDAY to get your discount! I have a question. What's makes your products so different from other products? I really would like to try your product so bad but girl the money I have is basically nonexistent lol. Excellent question! One of the reasons I made this line was because I was liking many products from different companies. I would like this company's shampoo, another company's conditioner, and another company's other product. With my line, I have combined everything I like in all of those products into one product line, Silk Hydration. My products make the hair extra soft, silky, smooth, and most of all they help the hair become healthier. I use high quality ingredients so that you can use a small amount of product and still get amazing results. All of my products are sulfate free and paraben free as well and are great for natural AND relaxed hair. I take the time to actually test the products on my own hair before even thinking of selling it to anyone else. If you are concerned about your money situation, I would encourage you to use up what you have first then you can try Silk Hydration so you can see the difference. Hope this helps! I have a question. I am transitioning. My hair is about to my cheek wet. I have not had a perm in a year. My hair is dry and very coarse. No good hair over hear. I would love to grow out my hair as long as it can get, however it seems to get so far and break, or lots is lost in detangling process. Have been using protective styles like braids and sew ins. Many stylist is my area shun the natural hair ideas and try to talk me into relaxing it for ease. Any advise on how to handle or manage for best growth potential? I have also been using Hairfinity for a year. While my hair is indeed thicker no true length is noted. I have never had thin hair to begin with.